Maker’s Mark bourbon has become something of a social media case study as a result of not only listening, but actually making -- or rather, reversing -- a business decision based on its fans’ input. But after its fans went ballistic on social media about the planned change -- even threatening to start boycotts in order to "save" the original formulation -- the Beam Inc. brand employed social media to announce its reversal of the decision, and apologize. 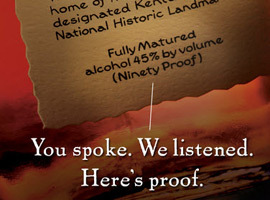 On Sunday, Maker’s Mark tweeted the message: "You spoke. We listened," to its followers, creating a hashtag that was quickly picked up by fans -- many expressing relief and thanking the brand for seeing the error of its ways. In a letter to fans that was posted on its Facebook page, as well as on its Web site, Rob Samuels and Bill Samuels, Jr. -- respectively the COO and chairman emeritus of Maker’s Mark -- wrote that they were "humbled" by fans' "overwhelming response and passion" for Maker’s Mark, and apologized for letting them down. Noting the brand’s supply constraints, they wrote that “while we thought we were doing what’s right, this is your brand – and you told us in large numbers to change our decision … so effective immediately, we are reversing our decision … . The reversal announcement on the brand’s Facebook page generated more than 14,000 “likes” and 2,200 comments within two hours, reported TheBlaze. However, others maintained that the brand should have had a handle on consumers’ sentiments and the potential for backlash -- and some even suggested that it might have been wiser to ride out what might have been a relatively short-lived storm (although they obviously weren’t the ones fielding the phone calls and in-person complaints, in addition to the social comments deluge). And as The Washington Post’s Neil Irwin pointed out in some detail, the brand and its parent Beam Inc. now face other -- rather fundamental -- business and marketing dilemmas. Since good whiskey requires time to age, and the company didn’t raise prices once it realized that demand was outpacing supply, shortages began resulting in some markets. And since Maker’s Mark is one of Beam Inc.’s “power brands” – a major sales-driver that needs to be available in bars and retailers around the globe -- such shortages could be a serious problem, perhaps even eventually affecting relationships with distributors and bars/restaurants, Irwin noted. Meanwhile, Forbescontributor Tim Worstall noted that, even with the reversal, Maker’s Mark may have still turned off some brand fans -- and quoted a business professor who pointed out that basic supply/demand economics could have offered a logical price discrimination/market segmentation strategy: Creating a new brand extension with a lower proof and a lower price, while raising the price of the original, premium product. 1 comment about "Maker's Mark: Out Of The Fire, But...". Bill Bradley from Journal Broadcast Group, February 21, 2013 at 9:36 a.m. I agree that there was a missed opportunity here. Smaller batches of the 90 proof with a higher price is something that loyal drinkers would have embraced. Meanwhile a "thinned out" version at a lower cost introduces them to markets that have overlooked it because of it's cost. Seems like peer pressure won this round.